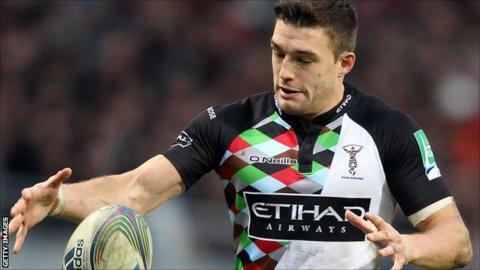 London Welsh have signed former England Under-20 wing Seb Stegmann from fellow Premiership side Harlequins. Stegmann, 23, joins the Exiles immediately and has agreed a deal that will keep him at Welsh until 2015. He came through the academy at Harlequins and made his first-team debut against Newcastle Falcons in September 2007 in the Premiership. "Seb is a good recruit for us - he'll add a lot of strength to our squad," said London Welsh head coach Lyn Jones. Stegmann scored three tries in eight appearances during the club's Premiership winning campaign of 2011/12, and made 35 appearances for Harlequins in total, scoring 11 tries. He represented England at U16, U18 and U20 levels, and won a Grand Slam with England U20s in 2008, scoring three tries. The same year he featured for England at the U20s IRB Junior World Championships in Wales. Jones added: "I'm really looking forward to working with him. "He is another successful product of the Harlequins Academy. He's had a very promising career up until now and will benefit from playing more games."